I was fortunate enough this past weekend to sit at a table with a diverse group of black folks who are just as interested in their family histories as I am in mine. The best part of it is they’re allowing me to join them on their journeys to learn about their ancestors, as we will work as a supportive group of researchers in what I’m calling “the genealogy project.” This makes me very happy. So I’ve mentioned the internship already. It started with an introduction to NiNsee. Genealogy already fell within their purview, primarily for those with Surinamese and/or Antillean ancestry. So when I proposed the idea of working with a group of people to help them research their family trees, they were into it. But even with my enthusiasm and their support, I worried that it wouldn’t become a reality. Between my focus on school and their already full plates, I thought it might be one of those things that gets pushed around and tweaked for awhile, until it’s finally forgotten about. Fortunately, my pessimism is no longer a decision maker for me. My new approach (most of the time) is to acknowledge what my hesitation or fear would want me to do, and then do the opposite – no matter how uncomfortable. So in this case, I just kept following up. It has required asking a lot of questions, meeting new people, and doing lots of research – more of which I still must do. Although I have a pretty good grasp on the history of Africans in the U.S., those who were taken to the Caribbean and South America have diverging stories, both in enslavement and freedom. So the history of Suriname is new to me – fascinating and new. I have one primary point person at NiNsee who is working with me on the project. Since the original proposal, she and I have met several times. 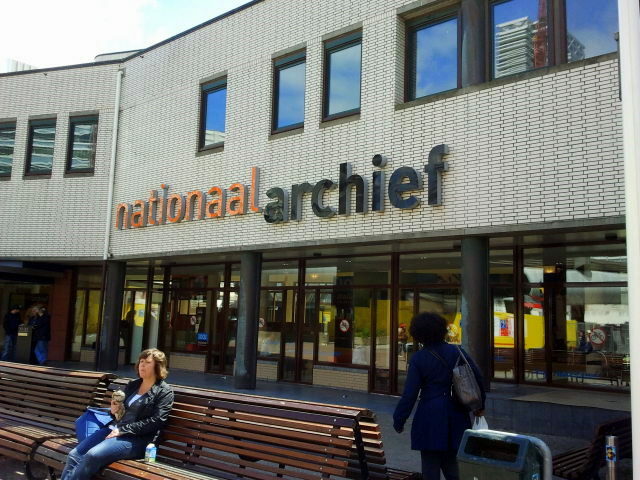 A few weeks ago we took a trip to the National Archives in the Hague, where we tried to figure out how the records related to former Dutch colonies are organized. Although they have plenty of relevant records, primarily from Suriname, they’re not all organized so nicely. But the staff is incredibly helpful – in spite of their obvious preference to speak Dutch. We were able to ask lots of questions and gain some level of familiarity with their process. 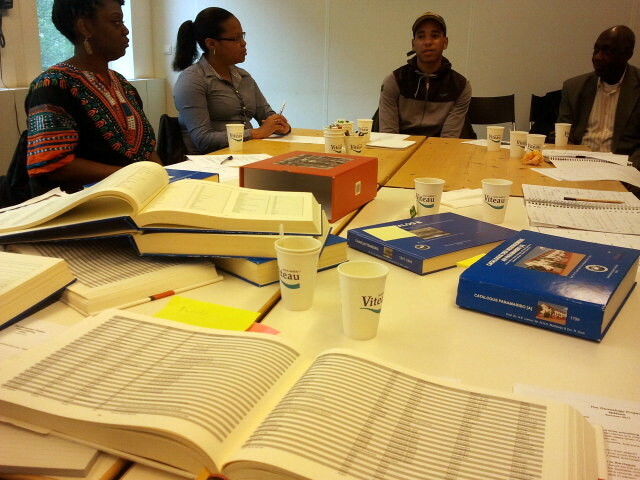 And before we left, we found one of her ancestors that she had been hoping to learn more about on a Surinamese census. In addition to the research side of it, I was worried about finding people to participate in the project. I’m American and I’ve been here for only a few months. 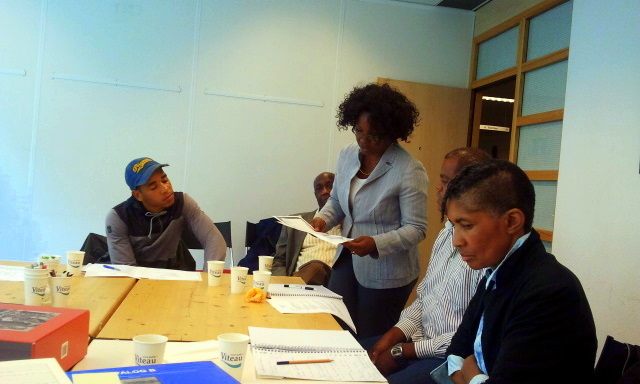 I’m not necessarily well-positioned to find a unique group of black, Dutch genealogists. But after making an announcement at a NiNsee event, and using some leads they already had, I managed to recruit a group of 8 people (it could be as many as 10). They range in age from early 20s to 60. And I’ve already heard some incredibly interesting family stories and a few mysteries to uncover. In individual meetings with a few of the participants, they each have had their notes that always include partial names, scratched out dates, and question marks. And they each speak about their families with a combined sense of enthusiasm and frustration. Most have someone to ask questions. But most often, that source has limited knowledge. And the real knowledge holders are usually long gone, having never been asked enough of the right questions. Although each participant has her and his own family to research, my goal is to remove some of the isolating feeling that can result from this type of project. For this reason, I’ve pitched it as a group project. NiNsee will be a resource, I’ll do whatever I can to help, and the group will offer support and inspiration, meeting every one or two months. Folks will make progress and they’ll face barriers. I’m hopeful the group will appreciate sharing in these various stages. So Saturday was the kick-off. Although the full group was not able to attend, I can see it’s the perfect group with which to launch this type of project. Everyone shared some of their stories and I shared some tidbits about my family. We had some interesting discussions about history and racial politics. Catalogs were pulled out and folks looked for their family names. And we could barely finish before everyone wanted to launch into break-out conversations with other members of the group. Since the meeting, I’ve already received some updates about conversations members of the group have had with mothers, grandmothers, and aunts (fathers have demonstrated a trend as being the ones who speak the least about family…). And so it begins! Everyone seems excited. I’m definitely excited. This sounds incredibly exciting! One thing that I’ve learned from my research over the years is that working with others (even when you aren’t searching the same families or topics,) is energizing. Sharing tips and shortcuts is very helpful in streamlining the process, and keeps you from getting discouraged when you hit dead ends. And sometimes we learn from others’ mistakes. I’ve done only a little work since I’ve lived in Ohio, because I didn’t have anyone here to work with. Amazingly, just last week I found The African American Interest Group of the Franklin County Genealogical & Historical Society. I am so excited. Until now my research was confined to trips home to Philly or on trips to the Underground Railroad Freedom Center in Cincinnatti. Keep us updated. I love hearing about your work. I am posting this comment on 6/16/2011 and not 16/6/2011. Dana has is now European Girl Gone! Seriously – amazing post, amazing project, amazing experience! It really sounds exciting. I won’t say good luck because I know its not about luck but determination. So proud of you.